PADI has been implementing this kind of water project for more than four years, beginning in 2003. The first implementation of the project was done in the Mletele ward at Liwumbu B streets from June to August 2003, where seven (7) improved traditional water wells were built. PADI received funds from Peace Corps Tanzania under the supervision of Mr. Tim Hogan. The second implementation of the project took place from September to November 2003, where PADI received funds from professors Miller and Rulfs of the USA and constructed 4 improved traditional water wells. The third project implementation took place from October 2005 to December 2005, funded by Help Age International, which enabled PADI to build 8 improved traditional water wells. The fourth implementation took place from July –August 2007.The project funded by Run For Africa, the funding enabled us to construct 13 improved traditional water wells and 1 bore hole. The fifty project implementation took place from Nov. 2007 to January 2008, funded by Help Age International, which enabled PADI to build 7 improved traditional water wells in Mshangano ward , in total over 6200 people are benefiting from the project. 1500 of school children are getting water which include Chandarua and Liwumbu primary schools where each received one Improved well while Mdandamo secondary school got one borehole last year financed by Run for Africa and Peace Corps. There are over 6200 (where 3300 are women and 2900 men) people getting sanitation by using safe and clean water they have been supported. They are using this because is clean and safe comparing to the water they were using before which was dirty ( over 1500 are children)..
Over 3500 (where 2000 are women and 1500 are men)of other people are getting other benefits including vegetable production, building construction one of those benefiting from this is Mdandamo Secondary school where after being supported with one bore hole they managed to start growing vegetables and increased school building because water availability near the school compound is possible, the same work was impossible before the bore hole and if they did the work was not effective. We have been agreed with each school community to build pump house soon after the installation of the pump at their own costs, at the same time the same community will have to formulate Water Maintenance Fund ( WMF) to sustain the pump. Also during the project implementation the community will organize a team of 10 people who will be supporting the project implementation at the same times they will be monitoring the project progress to see if the materials budgeted are being used as required and the required quality is observed. The project plan to contact one day training session on care, maintenance and repair of the wells to 2 people from each well . This will really help them to care and conduct miner maintenance and repair of the well without waiting until the wells is completely destroyed and it has been found to work well in the former wells. To make the wells well maintained it has been planed that the school community will make contribution to the WATER MAINTANANCE FUND ( WMF) ACCOUNT at the rate of USD 139.13 for each hand pump per year which will help to do miner repairs. The contribution rate per year will be increasing as it will be deemed necessary depending on the running costs per year. At the present Mdandamo secondary school apart of school fees the students are always requested to contribute Tsh.2000 which is equivalent to USD. 1.73 per year to support hand pump maintenance. More details see the attached project budget file. I appreciate the listing of the past projects, but much of the enclosed information is repeated from your Organizational Profile. Since we are focusing on how this specific project will work I would like to read more in detail about the model. How do you mobilize community? What makes what you did in the past a success. Not just that you did it. But HOW you did it. Also, in the project history, can we hear about the "need" in the community? what is the water situation now? Please explain the numbers: we would like to see the numbers that going to be impacted by this proposal. Reading the text, it appears that the numbers refer to the people already helped by earlier projects (39 wells and a borewell) or one could read it as the total population. Also, the numbers are the same in both applications. •	Sorry the number of Beneficiaries who are going to be impacted by this proposal didn’t appear in the project background, only appeared in short project Description. To rectify this, the number of beneficiaries who are going to benefit from the project in total are 1200 students ( From Kalembo Secondary school have 505 students, Luwawasi sec school 417 and Chandarua Sec. School 278 ) of which 592 are girls and 608 boys. •	It is true that the Number of people benefiting from the past projects is the same in both applications because the project we expect to implement this year will be in the same wards we implemented last projects except it will be in different schools and villages. The beneficiaries are the part of the total population of 37,303 people in three wards where we implement the project. Could you specify the type of pump? What is the maximum depth it can get water up from? Do you know the depth of the water table? Or is it just an estimate or common knowledge? i)	For safe water to schools if their request is to have hand pump-the school community are required to construct pump house as their contribution , form Water Maintenance Fund ( WMF) and Wells Monitoring Committees (WMC) which consist of 10 people per well. When all these have been agreed they always sign a contract of receiving the support( contribution for this range from 10-20% or more ). this range between 30-45%) . 1.Mdandamo Secondary School is among the beneficiaries of the project . Before the support students from Mdandamo had to move about 1.km to 2 km far away from the school fetching some water. The students wasted a lot of time for fetching water for a variety of uses including cleanliness, cooking and school buildings construction. They missed many lessons because of water problem. It was not easy to grow neither vegetable nor flowers as it was not easy to access to water for such activities. It will be good if you can have a proper survey of the number of pupils that will benefit from each school to have realistic a figure. Are there school management committees in each of the schools? If so are they part of the water maintenance management fund committees? It will be good if you can have a proper survey of the number of pupils that will benefit from each school to have realistic a figure. Are there school management committees in each of the schools? If so are they part of the water maintenance management fund committees? 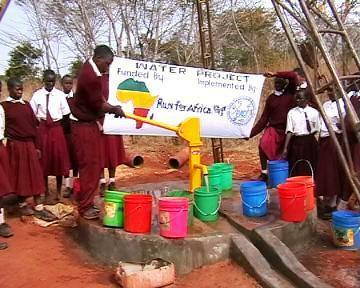 •	The project is going to provide 3 Hand pumps to 3 secondary schools, 1 hand pump to each school. The Number of students who are going to benefit from the project are 1200 ( 592 are girls and 608 boys) where Luwawasi Sec. School have 417, Kalembo Sec. School have 505 and 278 from Chandarua Sec. School. •	The ten people described in the proposal on a part of community organization will be the school management committees in each school and they will be responsible in hand pump maintenance and managing maintenance fund. At the moment we have not a plan concentrating in health and hygiene education and other community outreach activities except after training them to care the well surrounding environment. •To avoid washing, bathing , cultivating or doing any sort of human activities including cultivation of the upstream land to avoid deforestations and water contamination. • Also we teach them to practice a forestation around the well areas to avoid water source dry up. We think your observation is good for us to consider this and concentrate on it. Water programs in schools really should include hygiene education. It is a low cost high impact intervention. It is a very good project and i believe if the implemetaion strategy is followed the sustainance of the project is also ensured. Without a coherent and complete presentation of the project, it is difficult to assess, although the need is apparent. Water and sanitation projects in schools are a clear and important investment in the future. The pairing of these two elements is key in changing habits of children and future parents. There is no active health element in this proposal , but I have witnessed on many occassions that children instictively are drawn to a water source and activte whatever hygiene practices they have learned. Simply hydrating the body properly is sufficient to ward off many illnesses and deal with eye problems due to dust, sunlight, and smoke by lubricating the eye. I suspect these will be benefits of such a project. This project would be greatly improved if PWX would extend funding for hygiene education along with the water supply. This is a nice project, but needs to be presented more holiticially and with better attention to all the issues. It will be hard for BPR to fund the entire project. Depending on funding remaining, it might be possible (and better) to fund one of the wells and keep the other 2 for later (if that is possible to do at the implementer level). I believe that the experience to roll out projects is there. I would like to see if there is a way to strengthen this orgs capacity to write effective grant proposals.